Artwork will arrive matted & covered with a protective archival film. Framing is also available at additional cost after checkout. Skulls are a fascinating subject – they are at once a symbol of our mortality, and also a symbol of our humanity. 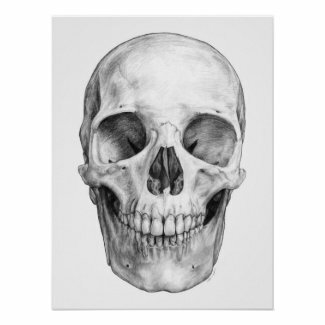 Ubiquitously recognizable, the human skull lives beneath our skin, yet it also shapes it and makes us beautiful; it stands as a mute homage to our ancestry and ancient DNA. This drawing was created painstakingly from a small photograph I found at the library, thus much of the detail had to be improvised. It took about 30 hours to complete. This is so beautiful! I want to buy a print but can I have it signed? I am in mainland USA after a 12 month contract with work in Guam. I am a fan of your work. I anticipate getting some originals (yes, more than one). It is a pleasure to be connected via IG as well. Dr. Hill! So glad you are back in the USA! Thank you so much, I am honored <3. Anytime you are back in NYC, please let me know and I'll give you a studio tour :).